PORTABLE PANEL BOARD SPLITTERS are used on industrial turnarounds to re-direct the primary operating voltages, usually, 480v-3ph or 208y-120v-3ph to specific equipment power needs like Portable 400amp Welding Panels, 600amp portable welding and gfci distribution panels, portable 480v HAVAC systems, and portable 50kva 480v-120v gfci power stations. Splitter panels takes the primary voltage from power supply and splits operating voltage to a select number of power outlets. These outlets deliver primary voltage to individual power needs. Splitter Panel are most commonly used with larger 220kva or 125kva portable diesel powered gen-sets. 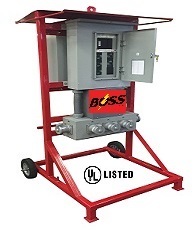 Welding type 4/0 Type W cables with cam-loc connectors are use to make connections between portable diesel gen-sets full power panel lugs to the line side cam-loc connections of splitter panels. 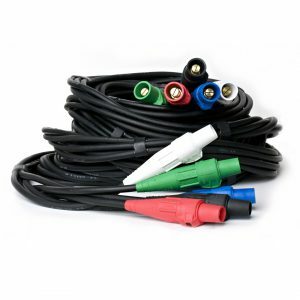 Cam-locs are the safest and easiest method of making power connections on portable splitter panels. 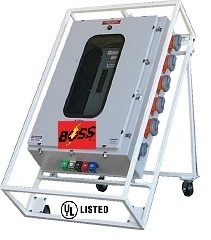 Bossltg is a UL Certified job-site portable temporary electric power distribution UL1640 assembler.